Only 7 left! This item ships in 1-2 days. Make bedtime even more comfortable and special when you give your new little girl some of these personalized pillow cases for her bed. As she gets older, she'll always have this pillow by her side that she knows was made specifically for her. 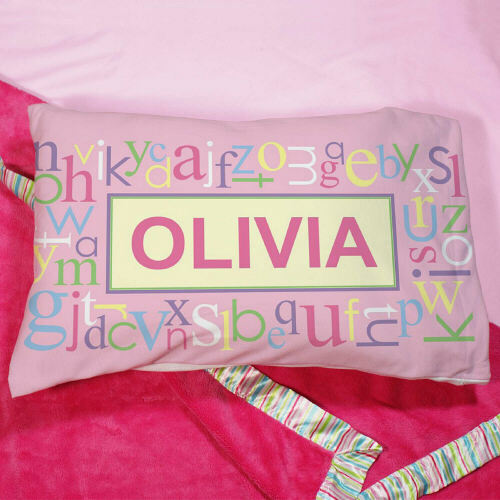 This Personalized Alphabet Youth Pillow is printed on one side of our 100% Polyester White Pillowcase and measures 12" x 18". The Pillowcase comes with our standard Travel/Youth size pillow and is machine washable. Free personalization of any name is included. I bought as a gift. She loved it !! The pillow was more than I expected. The picture did not do it justice. This pillow is so nice. I ordered this for my 4 year old daughter to have a school during nap time. My daughter loves it!! Thanks!! I was pleasantly surprised with a such high quality product! It is lovely! I also purchased the matching wall canvas. My son & daughter-in-law loved it too. I have already ordered a variety of several other products. I highly recommend this GiftsForYou. Additional Details This would make the perfect personalized gift for little girls from infant to youth age. They can use this pillow for trips, sleepovers and every night at bedtime. Our Personalized Princess Night Light will make her feel safe as she falls asleep each night.